Guest Blog: Support an Artist While Spending Nothing by .carolinecblaker. This post originally appeared on an artist friend, Caroline C. Blaker’s, blog. Caroline is an Albuquerque, NM artist that I have had the pleasure of knowing for around three years now. She has graciously given me permission to re-post the blog here. Please visit the link to her website and check out her colorful, inspired art! One way to support an Artist is to buy art. If this isn’t an option for you, there are costless ways to make a huge difference in an artist’s career path. Any person who loves the art of an artist can make a huge difference. Many people feel that supporting an artist beyond compliments and verbal encouragement is out of their reach if they don’t have money to buy artwork. While the best way to support an artist is to (buy art and) support their livelihood, here are a few things that are free, that make a huge difference to the artist you would like to support. 1. Share their work ~ Do you have a Facebook account? Twitter? StumbleUpon? Guess what – if you said yes, you also have a network outside of the reach of the artist you would like to help, and chances are your network and you share a lot of common interests, so why not this artist? The options are endless here: share one piece, their portfolio, their blog, their events, their entire website, their facebook page – and the list goes on. Don’t know quite what to share? Ask the Artist! 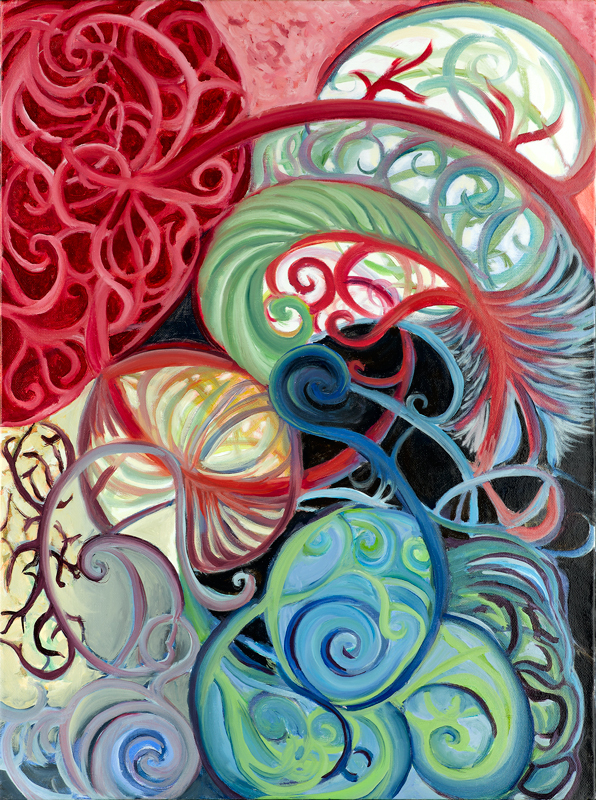 Untitled with Spirals by .carolinecblaker. 2. Volunteer time or skills ~ If you live near an artist this is easy – hang a show with him or her. Help set up a studio open-house, or just go to the artist’s events, talk to strangers on their behalf, and start conversations about the art. Don’t live near the artist? You can still write a blog for them, talking about your opinions of their work, or introduce their work to somebody else in your network, one on one, who you feel may be as interested as you are. 3. Participate ~ if the artist you know is collecting materials of any kind, this is a fantastic way to support them. My collection of credit cards would be nowhere without 5 specific awesome people – yet I could be completely buried in credit cards if only a percent more of my fan base saved their solicitation credit cards they get in the mail, rather than throwing them away. Chances are, if you are able to collect it, the artist will willingly and gratefully facilitate the transportation of materials back to his/her studio for use. 4. Inform them ~ Have a favorite gallery? Or just a place you drive by all the time that reminds you of them? Know of an upcoming exhibit that you feel they would like? Did you go to a show and end up speaking about an artist to someone, or see work that reminded you of theirs? Artists who are trying to emerge mainly seek opportunities to expand their reach to a relevant audience, something that is a lot trickier than it may appear to you, as someone they have already reached. If you have a quick tip or direction, they will do all the work to pursue it, and you will get all the credit! 5. Be ready ~read their content, subscribe to their newsletter, and have conversations with them about the work you like or the content they send. Know some key points to their artist statement. Know where they come from and what they value about their background. When you have the opportunities to act on the previous points, you will be educated enough about this artist to be able to share them, volunteer, participate, or inform them with relevance and timeliness. Let me tell you a little secret – an artist’s popularity isn’t defined by the sales they make. It’s defined by the number of people who know about them and admire their work. Secondarily, it’s also defined by the number of people who hate their work. As much as a fan will tell their friends about a great experience they had somewhere, or a great product they bought, or a great artist who inspires them, an average consumer will talk five times more about a product they hate, an awful experience somewhere, and maybe even art that they saw and hated. Artists deal with a lot of rejection, but attention is attention, and if a person is fired up about artwork, either positively or negatively, and they talk about it, it counts as valuable publicity and attention. Even better, the folks that don’t like it, who share it as “bad” (or whatever they come up with,) are unwittingly supporting this artist whom they despise.Popularity, more than any other thing, drives art sales throughout the art industry. Assuming this, there is no network that is unsuitable for promoting this artist you like, especially not yours. And yes; your time, attention, words, and information all count, and the artist should notice – and if they don’t, there’s nothing wrong with bringing it to their attention. They will react with gratitude and take notice that you are paying attention to what they are doing, and if they don’t, don’t feel the need to continue supporting them. Without a captive audience, artists never reach the collectors, buyers, or patrons who have the power to make or break their career. The bigger this audience is, the better the artist’s chance at succeeding at what they are trying to do – sustain themselves solely with their artwork, and the better their chances at sales in general, even if you never buy anything. You can play a role in the success of your favorite artist, a big one, without any money at all. You just have to want to support them – then take action.